It can switch between them on the fly and will be supported on Android P.
As headphone jacks continue to disappear, wireless options for audio are becoming more important than ever. 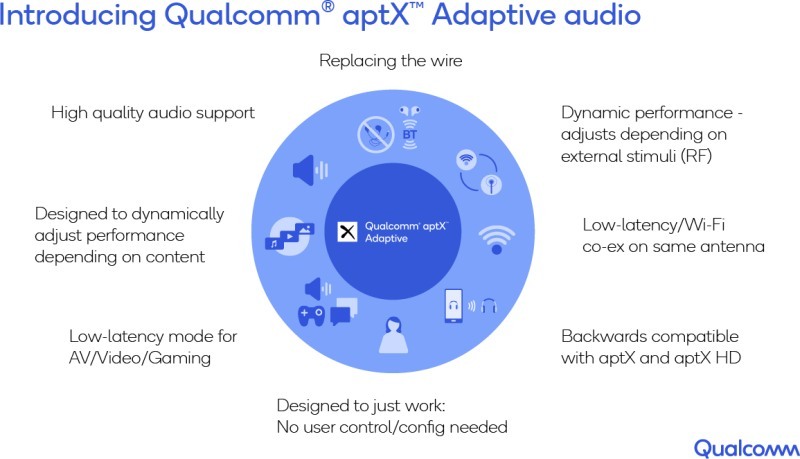 In 2015, Qualcomm acquired the aptX codec for Bluetooth audio connections, and currently offers technology as a pair of extended flavors: aptX HD for "better-than-CD high definition sound quality" and aptX low latency tech keeps things in sync for video or gaming applications. Today it's announcing aptX Adaptive which takes a "why not both?" approach suitable for the way most of us live now, playing different types of media across multiple devices and environments including VR and mixed reality. aptX Adaptive is able to dynamically choose between the highest quality audio available or low-latency and low-bit rate if that's what is needed, while also taking into account the quality of the RF signal between devices. That should make it easier for a phone with the technology to play crystal clear audio in your car, for example, and also make sure everything is synced up when you're watching a video on a plane with wireless headphones while competing with a dozen other people using Bluetooth to do the same thing. In a statement, Qualcomm senior VP Anthony Murray said "With this new product, listeners don't have to do anything while aptX Adaptive dynamically adjusts performance to best deliver exceptional audio whether the user is playing games or listening a song." Like current aptX tech, the decisions should happen between any two devices carrying the appropriate capabilities and logos. On the receiving end, a decoder for headphones and speakers will be included in a pair of Qualcomm's Bluetooth 5.0 audio chips starting in September. On the player side, it doesn't sound like everyone will need new hardware to take advantage of the feature. An aptX encoder built for phones -- not iPhones, as Apple has not used the tech up to this point and instead has focused on its exclusive W1 -- and tablets should be ready to roll on Android P in December.